The LT1170/LT1171/LT1172 are monolithic high power switching regulators. They can be operated in all standard switching configurations including buck, boost, flyback, forward, inverting and “Cuk.” A high current, high efficiency switch is included on the die along with all oscillator, control and protection circuitry. Integration of all functions allows the LT1170/LT1171/LT1172 to be built in a standard 5-pin TO-3 or TO-220 power package as well as the 8-pin packages (LT1172). This makes them extremely easy to use and provides “bust proof” operation similar to that obtained with 3-pin linear regulators. 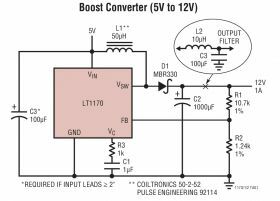 The LT1170/LT1171/LT1172 operate with supply voltages from 3V to 60V, and draw only 6mA quiescent current. They can deliver load power up to 100W with no external power devices. By utilizing current-mode switching techniques, they provide excellent AC and DC load and line regulation. The LT1170/LT1171/LT1172 have many unique features not found even on the vastly more difficult to use low power control chips presently available. They use adaptive antisat switch drive to allow very wide ranging load currents with no loss in efficiency. An externally activated shutdown mode reduces total supply current to 50μA typically for standby operation. This data sheet is only intended to provide specifications, graphs, and a general functional description of the LT1170/LT1171/LT1172. Application circuits are included to show the capability of the LT1170/LT1171/LT1172. A complete design manual (AN19) should be obtained to assist in developing new designs. This manual contains a comprehensive discussion of both the LT1070 and the external components used with it, as well as complete formulas for calculating the values of these components. The manual can also be used for the LT1170/LT1171/LT1172 by factoring in the higher frequency. A CAD design program called SwitcherCAD® is also available.